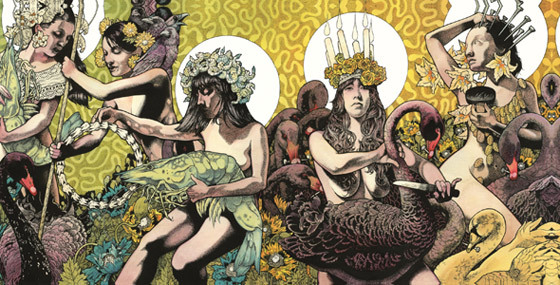 BARONESS have unveiled the art for their eagerly anticipated new album, Yellow & Green, which is slated for a July 13 in the Benelux & Germany and a July 16 release in the UK & the rest of Europe via Relapse Records. The album artwork was created by John Baizely, front man for the band who has created all of the band’s artwork as well as artwork for Gillian Welch, Kylesa, Black Tusk and Skeletonwitch. Baizley has become widely regarded for his modernized Art Nouveau style with Juxtapoz Magazine profiling him in their current (April) issue as well as the creation of an online gallery chronicling his creations: www.aperfectmonster.com. The band has also unveiled a new website at Baronessmusic.com. The new site reflects the artwork from Yellow & Green and is the band’s first official website.